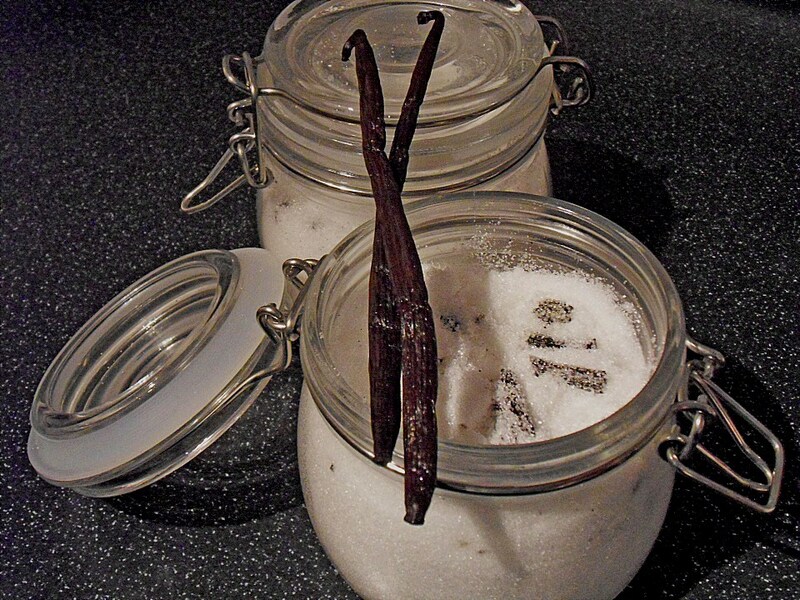 How to make Homemade vanilla sugar? I received this question quite often and decided to answer it in this article. To make your own vanilla sugar is some good idea especially when living in the USA as this popular German baking ingredient is not available in the main super markets (only in specialty stores). We use vanilla sugar in the most cakes and desserts. It cannot be substituted with normal sugar, you can buy it and the best is from Dr Oetker or you can make it at home. It is super easy. Happy Cooking! You can also use already used vanilla beans or use the vanilla seeds inside. Scratch the seeds out of the vanilla and add to sugar. For using the beans: Add half of the sugar in a jar with a lid (should be closing tight).Place the whole vanilla beans in the sugar, then cover them with remaining sugar; they should be completely covered. Let is rest for some days so that the fragrance will be in the sugar. Leave the beans inside the sugar. Use the whole bean; cut it in smaller pieces. Don't scratch the seeds out of the beans. In a coffee grinder grind the bean pieces with some tea spoons powdered sugar until they are really tiny. Sieve the sugar because powdered sugar can have some clumps. Fill powdered sugar in an airtight jar and add the mix from the coffee grinder, and mix well. You can use it right away. This variations is very strong, so use first a little bit, then try and add more if needed. The vanilla beans get very hard after some time. You can take them and cut them into very small pieces or grind them in a processor or mixer. If you add the ground vanilla beans the sugar will get brownish but more vanilla fragrance will be added. When the vanilla beans are hard cut them in small pieces and add them to the ground coffee. Adds some nice vanilla fragrance to the coffee powder. If you like vanilla pudding add the hard and dry beans to the milk, adds more vanilla taste to the pudding.